Tasmania’s Cradle Mountain National Park is a wonderland of spongey moss-carpeted floors, rolling buttongrass moors, scenic boardwalks, curious wildlife and the kind of trees that play host to entire worlds of budding, miniature greenery. 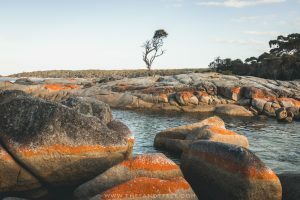 This beautiful national park was my absolute favourite stop in Tasmania and if you love being out in nature it should be an essential stop on your Tasmania itinerary as well. 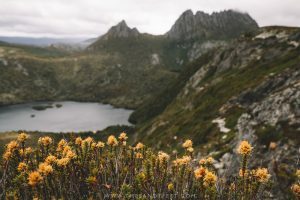 These are a few useful things to know before visiting Cradle Mountain National Park to help you prepare for your trip and preserve this rare pocket of pristine wilderness while you’re there. Like all national parks in Tasmania, you’ll need to pay the entry fee on arrival at the Visitor Centre which includes access to the Cradle Mountain National Park shuttle. The entrance fee is $16.50 per adult per day, but if you’re travelling in a group or visiting more than one park in Tasmania, it’s often more economical to buy the Holiday Pass which costs $30 per person or $60 per vehicle and is valid for 2 months (prices as of January 2019). Check here for more info. 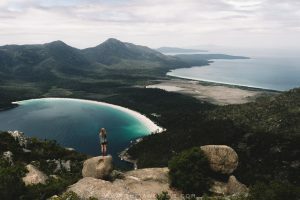 I visited Tasmania in early January – the heart of summer – and despite the wonderfully balmy temperatures along the east coast that called for daily swims and lazing in the sunshine, I was welcomed to Cradle Mountain with 5-degree weather and torrential rain. Layers are key so be sure to pack these essentials at any time of year: a thermal base layer (like this merino wool one), warm fleece or puffer jacket and durable waterproof jacket. In winter when average temperatures hover around zero degrees, a scarf, beanie and gloves are all a good idea. Given the area receives an absolute drenching of rain, a solid pair of waterproof hiking boots and hiking socks are also the way to go. I love my Scarpa Hiking Boots which are lightweight, water resistant and super comfortable, along with these Larry Adler Merino Wool Blend Socks, though these ones from Darn Tough are another good option. Between the plumes of mist and bearded trees, you’d be forgiven for thinking you’d just stumbled into Middle Earth, and while the gloomy skies actually lend rather well to these fairytale landscapes, if you’re here to hike, you’ll want to take full advantage of the weather when things begin to clear up. Low slung cloud and heavy rain can make the Cradle Mountain summit hike virtually impossible, whereas tracing the lower ridgelines might put you straight into a whiteout, stealing away the spectacular views. If your plans aren’t fixed and you’ve got some flexibility in your itinerary, don’t hesitate to make a beeline for Cradle Mountain if it looks like you’ll have a clear window, otherwise, keep an eye on the weather and leave the clearest days for the bigger hikes. Whether you’re driving or walking, Cradle Mountain provides plenty of opportunities for wildlife spotting. Around dusk, wombats emerge from their burrows in full force, as do wallabies and pademelons, and it’s not unusual to find them waddling across the road in a slight daze from their daytime slumber in search of an evening meal. If you’re behind the wheel, travelling on a winding road at the 40km/h speed limit, this can still take you by surprise, so be sure to keep an eye out for anything ferreting about on the roadside and always be prepared to stop. Out on the trails, you’ll more than likely see the full collection of Aussie cuties – echidna, pademelons, wallabies, wombats and, if you’re really lucky, the elusive platypus. In fact, we were lucky enough to see these every single day at Cradle Mountain and even caught a brief glimpse of a platypus diving about in the river. Generally, the animals will keep their distance so please repect that and certainly don’t go traipsing across the grasslands to get a closer photo – we saw this happening all too often! Keep your distance and, whatever you do, don’t feed them! There are signs everywhere imploring visitors to stick to the boardwalks, but it seems as soon as something cute pops up between the bushes, people lose all common sense. Not only are these rules in place to protect the wildlife and allow them to roam freely within their natural habitat, they also enable the fragile vegetation to thrive without being trampled and, in some areas, save you from falling into the many, many thigh-high bogs that lie alongside the boardwalks. With wisps of mist unfurling rapidly between the peaks and radiant golden light glimmering across the landscapes, sunrise and sunset in Cradle Mountain is an absolute feast for the eyes, and the lens. Dove Lake and its insta-famous boatshed are the obvious choice as they’re easy to access at any hour, offer up clear views toward the twin peaks and, if you’re lucky, you’ll get a perfect reflection to capture. But it’s certainly possible to set your sights higher and enjoy the dawn light from one of the upper ridgelines. Since October 2018, the free Cradle Mountain shuttle bus is now the only way to travel through the park during opening hours, that is, between 8 a.m. and 7 p.m. during summer (October through March) and 8:30 a.m. and 4:30 p.m in winter. Shuttles leave every 15-minutes or so from the Visitor Centre (more frequently when demand is high) and can drop you at any of the main stops within the park, including the Interpretation Centre, Snake Hill, Ronny’s Creek and Dove Lake. See here for more info. Though some visitors grumble about the fact they can no longer take their own cars into the park whenever they wish, I actually think this is a fantastic system that is efficient, convenient and goes a long way to easing congestion on the narrow winding roads, being less of a disturbance to the wildlife and dispersing visitors throughout the park. Outside of the opening hours, it’s still possible to drive into the park which I’d highly recommend to catch the sunrise and sunset, but when you go to leave after the park has opened, you must travel in convoy with a shuttle bus. There are a number of narrow one-way sections and the buses communicate with each other constantly to allow easy passage along the winding roads. Now, even outside of opening hours, there’s a boom bar at the entrance that remains closed, but the number of eye-rolling, facepalm moments it caused during my visit was enough to make you laugh, had it not always happened at the most frustrating moment, like when the sky begins to clear and you’re eager to reach the lake for sunset. Most often, visitors simply drive up too slowly to trigger the bar to open and then wait in front of the bar causing a queue to build up behind them. If you’re lucky, a ranger might come to help you out or see if there’s a technical issue, but chances are they won’t. If it happens to you that boom bar doesn’t open, try reversing a short way and then driving a little more deliberately and close to the gate. This worked virtually every time, often after we’d all sat there in a line like fools waiting for 15 minutes. For whatever reason, they don’t just raise the boom gate after hours, but you’d be surprised at how often this issue ocurrs. 8 | Leave No Trace! You’ll quickly notice that there are absolutely no rubbish bins anywhere around Cradle Mountain National Park. And yet, the landscapes are completely pristine and untarnished by the piles of trash that sadly are so pervasive in many other natural areas around the world. This does, however, mean that you need to plan ahead. If you’re bringing any food into the park or hoping to have a picnic lunch, remember to bring an extra bag with you to take away all your rubbish. This includes tissues, food waste (even fruit peels and cores), and of course, any plastics. Then, dispose of your rubbish responsibly when you’re back at your guesthouse. For those embarking on longer overnight hikes, like the Overland Trek, you’ll also need to pack out any leftover food, toilet paper and any personal hygiene products as well. These Leave No Trace principles are always helpful to keep in mind. Cradle Mountain National Park is by no means crowded, but the early bird does get to enjoy the soft morning light and have the trails more or less to themselves. As the vast number of people visit on a day trip from Launceston, the crowds usually arrive around mid-morning. If you can get on one of the first shuttles of the day and hit the trails bright and early, you’ll have plenty of time to disappear into the wilderness before the bulk of tourists arrive to spend their afternoon flitting around Dove Lake. Put simply, Cradle Mountain is a place of magic. From to the lush microcosms of budding greenery that dress every tree, to the fields of tea tree bushes blanketed in tiny white flowers that shimmer beneath a layer of fresh raindrops. From the abundance of wildlife and their freedom to roam to the ephemeral mists that roll across the mountains. From the sun-drenched boardwalks to the enchanting forests. It’s a place I was eager to return to as soon as I’d left. Car | Cradle Mountain National Park lies 140km from Launceston and 320km from Hobart, though the drive times given on Google Maps can be fairly deceiving. The way in is a series of winding country roads and tight bends that mean you’re often forced to drive well under the speed limit which can make your progress slower than expected. Renting a car is an ideal way to explore Tasmania and Cradle Mountain National Park and offers the freedom to explore the park outside the opening hours. Search deals on car rental here. Bus | It’s also possible to arrive at Cradle Mountain by bus with several services departing from Launceston, Hobart and Devonport throughout the week and dropping you at the bus terminal beside the Visitor Centre. Tour | If you’re really short on time, another option is to visit on a day tour from Launceston. Of course, this means your experience will be more rushed than if you arrive independently, but it certainly takes the fuss out of planning and will give you a wonderful introduction to the park. This bestselling Cradle Mountain tour includes all transportation, entry fees, lunch and a walk around Dove Lake among other activities. Otherwise, search available tour options here and here. Cradle Mountain is an impossibly beautiful place to visit, but staying overnight in the area sure doesn’t come cheap. You’ll find a handful of lovely but fairly pricy mountain lodges set near the park entrance, as well as a holiday park for the more budget-conscious travellers. Cradle Mountain Wilderness Village | We stayed in an amazing self-catering cabin at this property with a balcony looking straight out across the eucalypts. Despite the chilly outside temperatures, it was incredibly cosy indoors with a lounge area to relax after a day of hiking and a small kitchenette. It’s also well located just across the road from the Visitors Centre. A beautiful place to stay amongst nature. Highly recommended! Check rates and availability here. Discovery Parks | This Australia-wide chain of holiday parks is the only ‘budget-friendly’ option in the area, offering powered and unpowered campsites, dormitories and basic cottages for larger groups. Facilities include a shared guest kitchen, barbeque and laundry. Check rates and availability here and here. Peppers Cradle Mountain Lodge | Set right beside the entrance to the park, Peppers has a beautiful outlook over the wilderness and a small lake, perfect for wildlife spotting when things spring to life around dusk. This luxury property boasts spacious rooms each with a fireplace, a buffet breakfast, comprehensive spa and top-notch in-house restaurant. Check rates and availability here. Cradle Mountain Highlanders | This well-situated property amongst the trees offers up charming mountain cabins adorned with rustic wood detailing and equipped with a fireplace and kitchenette. Check rates and availability here. Cradle Mountain Hotel | The remaining hotel in the area is set a short way further from the park with modern rooms overlooking the landscapes. Check rates and availability here. Heading to Tasmania? Start Planning Your Adventure With These Guides!